Product #20546 | SKU 303-2101 | 0.0 (no ratings yet) Thanks for your rating! 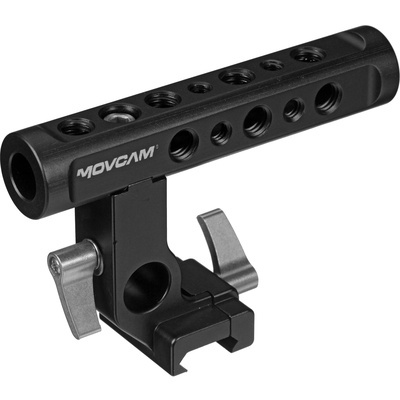 The Movcam Top Handle for Blackmagic Pocket Cinema Camera clamps onto a NATO-compatible rail and features 1/4"-20 and 3/8"-16 mounting holes for adding accessories, as well as a single 15 mm rod port. It is designed for use with the Movcam Body Cage for Pocket Camera when an optional NATO rail is added, but will work with any NATO-compatible rail.